Just saw this picture on twitter and it inspired me so much I decided to include it on my blog. 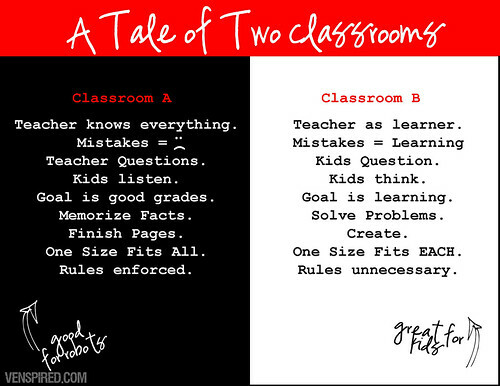 I do my best to create the environnement of classroom B, but it's easy to fall back on the model of classroom A because it's the one I experienced myself as a learner and that I know best. But I hate it !!!! So using creativity, trial and error, studying and learning, I do my best to reach this classroom B. But my god, it's not an easy road! post I realized it's new to me. Nonetheless, I'm definitely happy I found it and I'll be book-marking and checking back frequently!